It's Always the Right Time to Send Decadent Chocolate Candy Gifts. When special occasions arise, there are many gifts you could buy, but nothing compares with a dreamy chocolate candy gift. It's a rarity when someone doesn't absolutely adore chocolate candy. Chocolate is an all-time favorite when it comes to gift choices. To send your wishes to someone on a birthday, holiday or any time of the year shows your kindheartedness toward that individual. Many people adore chocolate and appreciate this delicious treat as a special gift. And today, you're no longer confined to giving just a box of chocolates. There are many delightful chocolate gifts and chocolate baskets to satisfy the sweet tooth of your friend or loved one. 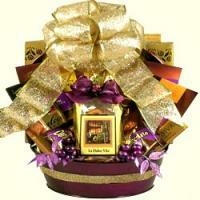 Chocolate gift baskets offer a magical opportunity to say, "I love you" or "I'm thinking of you!" Chocolate treats in a decorated basket make wonderful personal gifts and can be delivered to your loved one's doorstep with a personal greeting. Chocolate basket delivery can work for almost any season (with the exception of the very hot months). In the scientific world, chocolate has been coined as an emotional food. What better way to thrill the emotions of your mate or cheer a sick loved one, or even show sympathy for someone's loss? What better treat to offer on a birthday, holiday, or anniversary? 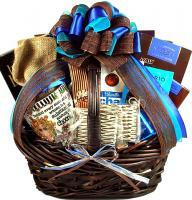 Chocolates are often tucked into get well baskets, food baskets, and many others. 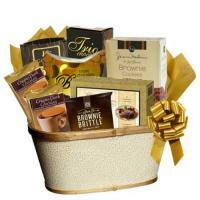 Our chocolate candy gift baskets are fashioned beautifully to bring joy to your recipients for any occasion. You'll discover a treasure trove of heavenly chocolate baskets as you browse our website. Our distinctive chocolate gifts are filled with high quality goodies that will soothe any sweet tooth. Does your friend love Ghirardelli chocolates? Why not display some generosity with one of our delightful? These offer treats such as chocolate bars, chocolate squares, and other chocolate blends with mint, nuts, dark chocolate, almonds, and more. 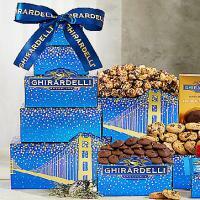 Adorable Gift Baskets features Fannie Mae, Rocky Mountain chocolates, Ghirardelli, Godiva and more fine chocolates. Other surprises found include chocolate covered strawberries and chocolate candies in a variety of flavors, savory hot cocoa mix, chocolate cookies, chocolate-covered popcorn, chocolate nut clusters, caramel chocolate snacks, malt balls, and truffles. Chocolate candy is perfect to share with your lover. Or, you can dazzle a friend or loved one with holiday chocolate, or have a chocolate candy gift basket delivered to a loved one that's hospitalized due to an illness. Chocolate is a wonderful comfort food to tame the emotions during sad times. Amaze your co-workers, employees, or clients with one of our ambrosial corporate chocolate gifts. You can send chocolate candy gift baskets for Christmas, birthdays, anniversaries, celebrations, Mother's Day, Father's Day, or any other time you want to deliver a sweet, sugary gift to someone special. Chocolate is made from the beans of the Theobroma cacao tree. White chocolate contains cocoa butter (the fat from cacao beans) but no cocoa solids. Chocolate can be toxic to cats, dogs and some other animals. Chocolate should be stored at around 60 degrees Fahrenheit. One ounce of semisweet chocolate contains about 18mg of caffeine (a can of cola contains around 29mg). White chocolate is about 1/3 fat by weight. Chocolate covered snacks, truffles, Godiva, Ghirardelli, milk chocolate, white chocolate, dark chocolate, chocolates with nuts, chocolates with creamy centers, chocolate-covered espresso beans, chocolate covered caramels, chocolate, chocolate and more chocolates. Valentine gift baskets are often overflowing with chocolate delights. Holiday gift baskets often include a few chocolate indulgences. Easter gift baskets greet kids on Easter morn with chocolate bunnies. Even romantic gift baskets usually feature a few chocolate treats. In the business world, you'll find corporate gift baskets or business gift baskets filled with chocolates to welcome a new client or to reward employees. Chocolate baskets provide numerous ways to demonstrate your thoughtfulness or gratitude. And, what treasures might your recipient discover in their chocolate gift basket? You guessed it - Godiva or Ghirardelli chocolates, caramels, chocolate pretzels, gourmet chocolate cookies, and a host of other chocolate assortments. 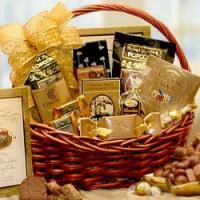 Adorable Gift Baskets offers many chocolate treats in our inexpensive gift baskets. You can browse gourmet chocolate lover gift baskets such as Godiva Pure Decadence, Chocolate Visions Cookie Gift Basket, Ghirardelli Gift Assortments, Say It With Chocolates, A Chocolate Gold Mine, Sweet & Savory Expressions, and many others. Gift basket delivery is right at your fingertips to anyone in the continental U.S., so go ahead and browse our selection of affordable chocolate gift baskets today. Send chocolate gifts express your passion, your affection, and your friendship.